Precision? *cough, cough* Bring me that legendary dial caliper, let’s show them what absolute precision really mean. I don't understand some of the reasoning behind some of thd 1 stars. I mean... the bit about this being a typical Chinese fantasy novel doesn't make sense to me. It's clearly a Chinese fantasy and it says as such and is fairly obvious that it will have some of the common stuff that's found in most Chinese fantasy. It's like people don't realize certain things about China and assume people are free to write as they please there. Or the one about how long it takes to complete a transaction.... more>> Chinese writing tends to be flowery and filled with flattery. Unless the translator or editor cuts off those things, there will be a lot of words being used to describe one thing, most often in several different ways. It's part of the culture. The story of a hard working guy who is earnestly trying to save his family business while trying to cope with recession, inconpetent workers and just plain bad luck. One day an accident happened in his factory, and on his way to the hospital he witnessed a mysterious phenomenon that will change his life. Really 47 people voted one star on this novel.. I am guessing it is just because of the picture. It does not deserve to have such a low rating compared to other novels that have 4.0 or higher that aren't any better then this novel. I think that this novel is quite good, if you like business management novels. I prefer talking about flaws about the novels I read in general so here it is. It seems a bit too easy for our MC, that's one of the flaws with this novel that... more>> I currently have. I'd like more details on his power and to know how the summoned monsters think, as I was quite surprised when one of them was acting arrogant, while there's no explanation about them. Do you know, one of the reasons why good novels aren't read is mainly because they're covered up by bad marketing. For this, Monster Factory, I blame the covers. The first cover I saw was a bunch of hulks in construction equipment. 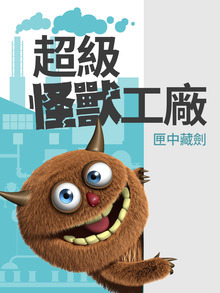 The second cover is a cute cartoon monster that's supposed to attract what kind of audience? Monster Factory is a good novel for what it's supposed to be. Monsters? Yes, there are monsters and the rules behind their use make sense and are nice to read. You have grunts who follow commands well and are very hardworking and precise. You have master craftsmen who are smart, sly, confident, and very good at giving commands. There are land dragons for mining, living armor metallurgists, electric brats with supercomputer-grade tech skills, and giant titans 20 meters tall for the delicate, but massive work. While the MC is limited in how many monsters he can have, that limit increases as his factory levels up and the stage he has to walk becomes larger. It's nice to see some balance. The Monster Factory provides the MC with both monsters and black technology. He goes from building super construction machines to household robots, to the most futuristic phone one could hold. His smart electric cars are to die for, and I know for sure I would like a set of super light, super comfortable bulletproof clothing. This MC's goal is to surpass the previous the businesses around him and beyond. He eventually goes against world-grade companies like Apple, and he isn't afraid to tackle them in their home territory. Countries? The US is his main issue atm, and that's mostly due to President Trump trying way too hard to insincerely catch him and his super company (sending a military jet to harass your private plane home is a d*ck move, but seems very Trump-like). Nationalism and racism is minimal, but it's not completely gone. But since I've read HacKer, it's on the easy side of things. Currently, I feel this novel deserves a higher score than what it currently has. I would say the story has similarities with "Bringing The Farm To Live In Another World" which I also enjoy reading. The setting of the story is in the modern world where the main character (MC) has terrible luck which can be seen in the 3 early chapters. The variety of emotions shown by the MC in his reactions in these circumstances make him likable almost making the reader root for him (not sure if it will be the same in future chapters as most start off good and drop). If you like business management, give the first ~100 chapters a shot. They are fun. The chapter where his minions deals with knockoff manufacture is about where it peaks, I advise stopping after that. Story is solid ~4 territory until this point because you can reasonably suspend disbelief. I think after this point, once the factory starts expanding, suspending disbelief gets very very difficult the modern setting just leaves me questioning the world. Where are your corporate spys? Where are your government agents? How can he literally mine an area without... more>> getting noticed? Why is the military not taking his research for their projects? If you invent a metal that can self repair, and can make enough to cast the hull for a dozen ships, tell me the Chinese government won't want that for tanks and research? Most of all, Why is NO ONE asking him questions? His parents are just out of the picture after he pays the bills, so why don't they question their son? Early on he lies and says "imported/borrowed technology" to them, but everytime it's publicized in the news it's all "Our innovative county is light years ahead of everyone else". Why aren't they calling this bluff? This is too big of a leap. This wouldn't be allowed to sit stationary without reporters from across the world questioning it. People would ask if it was a weapon. They would be scared a tiny bit, but most of all, if it wasn't a weapon, people would make it one. Damn, this series is really refreshing and interesting. The technical bits do not really matter, because it's that enjoyable. And he has this greedy bits, when he want to have this and that, which make it more real. The story is quite linear until newest chapter, but I really enjoy it so far. Recommended for all kinds of reader, which very much done with reincarnation stories. Unusual setting to say the least (although those "app influencing real world" are starting to get popular), but so far it seems fairly decent. I never understand the mass of either 5 stars or 1 stars, especially when it's neither garbage nor near perfection, but from what we have now, it could turn into a fairly interesting story, if the author continues with the setting of using actual machinery. A bit early for me to rate it, as it's fairly often that the major flaws of a novel only appear after a... more>> while, but those first 5 chapters are fairly decent quality, both writing and translation. Highly enjoyable read. I'm personally pretty much up to date with the raws. Likewise, the translator does a pretty good job. There are some small diction/grammar mistakes but they don't detract from reading too much. I had my doubts when I was reading the introduction and when I saw the picture of the cover, I thought this was going to be a pokemon-ish kind of story however it is not. If you are into fighting and cultivation novels then you will not enjoy this novel but if you like empire building then this might be up your alley. this story's setting is in modern day China wherein a young man who graduated as an engineer works hard to make their family business survive in it's... more>> industry however as life would have it the company is experiencing it's downfall. His cellphone then becomes a "magical item" that can summon monsters who specializes in their line of work. Now he must try to be the number one company in the world without tipping the balance too much or they might suspect him of having some alien technology. if you are going to give it a try then I suggest reading at least 50+ chapters to get an idea on how the story will flow. 1. Translations are decent quality. It' well written, it started by explaining a normal and likable MC and his circumstances and what led him to obtain this lucky chance. The Monster Factory can give him benefits but it also takes into account that it has to be kept secret. The Story is really interesting I hope you read it at least half the chapters before reviewing. The MC is quite ambitious and hilarious. Although the technical terms in industrialization will somehow leave you confused but the story will want to make you wanting for more. It's a fun read. Highly recommended for those empire-building with comedy and slice of life aspects. This novel explain some exaggerated things of what if a factory can do this with the most epic factory workers (hulk man yeah!) and state of the art futuristic machinery (robots anyone?). As for the plot I guess getting rich and so one so in the norm which is good no complicated stuff. But we can expect some major conspiracy,... more>> scheming and betrayal. At first I got lost reading as I barely understood things and with some bias thoughts from the reviewers I didn't expect much but to my surprise it was actually a good read. The MC saving the day approach is seen in a different way not your typical MC saves the girl thing.